If you love sweepstakes, you might dream about receiving a phone call that you have won an amazing prize. But unfortunately, if you don't know how to detect a telephone sweepstakes scam, that dream can turn into a nightmare. And don't make the mistake of thinking a phone scam won't happen to you, they're more common than you might think. According to Fraud.org's 2014 scam report, the majority of scam victims were contacted by telephone first. Why? Because VoIP services like Skype do such an amazing job of providing low-cost telephone calling from around the world. In most cases, that's a great thing, but it does give criminals an opportunity to make lots of calls for very little money. What Does a Telephone Sweepstakes Scam Sound Like? Maryann Westhouse received a message on her answering machine from someone claiming to be from a car dealership, telling her that she had won a Cadillac. (Most legitimate companies won't leave an answering machine message when you win, but some will, so this is not a sure sign of a scam). 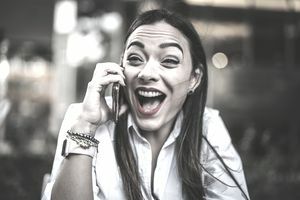 When she called back to claim her prize, the person at the other end of the line started asking her a lot of sensitive information - her income, her age, and so on. Note that Fraud.org recommends not giving sensitive information over the phone, including "your full name, mailing address, Social Security Number, bank routing number, credit or debit card number, or other types of information about yourself." Legitimate sweepstakes collect necessary information with an affidavit. Maryann was lucky enough to have legitimately won a car several years earlier, so she knew that something was fishy with this kind of call. When Maryann asked what her income had to do with winning a car, she was told that she was asking too many questions, and would no longer be a "finalist" if she didn't answer. Earlier in the conversation, they had confirmed that she had already won the car! Highly suspicious of this behavior, Maryann's husband called the corporate office for the dealership that the callers claimed to be representing. Not surprisingly, they were not running any sweepstakes for a Cadillac. If Maryann had not been alert enough to balk at providing this unnecessary information, the scammers could have gotten enough information steal her identity, opening credit cards and piling up debt in her name, ruining her good credit, and making life difficult for her. So how can you develop the same instincts that led Maryann to realize that she was being scammed before she lost money or fell victim to identity theft? Asking for a Lot of Personal Information: Legitimate companies will already have the information you submitted through the entry form. Additional information can be requested by an affidavit. So too many questions is a red flag that you're being scammed. Pressure to Answer Immediately: Legitimate sweepstakes sponsors understand that people might have some questions for them, too. And they won't mind answering them or giving you the chance to verify that you've really won. They won't pressure you to make an instant decision to trust them. Legitimate Sweepstakes Details: The person at the other end of the line should be able to tell you the name of the sweepstakes and the company sponsoring it. It should be something that you remember entering or can find with a quick Google search. A Mysteriously Changing Prize: If you've really won, your name will have been drawn to receive a specific prize. You won't be told you might win one of several different things (a car OR a trip OR something tiny is a common ploy of scammers). And you won't be told that you're a winner, no a finalist, no, maybe you haven't won at all. (Don't be thrown if you're told you're a potential winner, though. That's normal until your information has been verified). Either you've won or you haven't. Other Common Scam Signals: Be sure to also know the top warning signs of sweepstakes scams by heart, many of which also apply to telephone scams. And PCH is a company that is often misused by scammers, be sure you also know the signs of a Publishers Clearing House sweepstakes scam. Hopefully, every prize notification phone call you receive will be legitimate. But by knowing the common signs of phone scams, you can help keep yourself safe and protect yourself from fraud and identity theft.